I consider it a wondrous happenstance that I discovered this little book for sale online. I knew nothing about it, and there was no picture of its pretty cover, but it was priced low enough that I was willing to purchase it just to see what it was all about. It took a while to get here, 18 days in fact. Had I been taken in, ripped off? Where was this book? Was there no book? I checked my order confirmation a week ago and realized that they had noted arrival sometime between Feb. 21 and March 3. I waited some more. When the book finally showed up in my mailbox on Monday, I realized why it took so long to travel from its shelf at the booksellers to my garden library. It came via Royal Mail from England. Finally, it is here. It's a charming little book full of book fairies and anecdotes about flowers and gardens. It has no publication date noted anywhere, but it does have a book plate inside, giving me a clue as to when it was probably published. 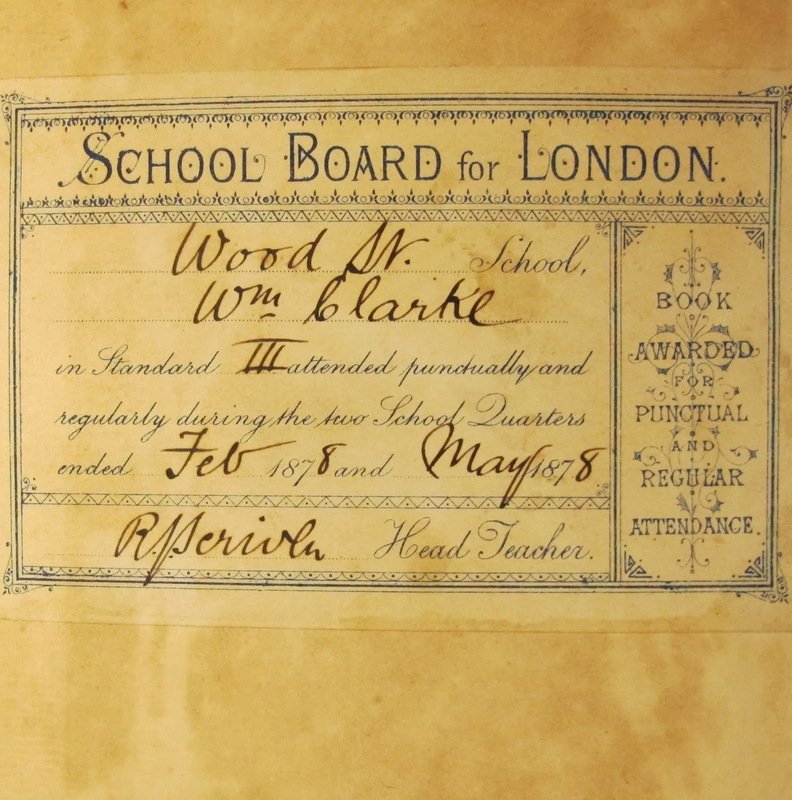 How about sometime around 1878, or 136 years ago, when it was awarded to William Clarke for "punctual and regular attendance" by the School Board of London. The book is in remarkably good condition for something so old. 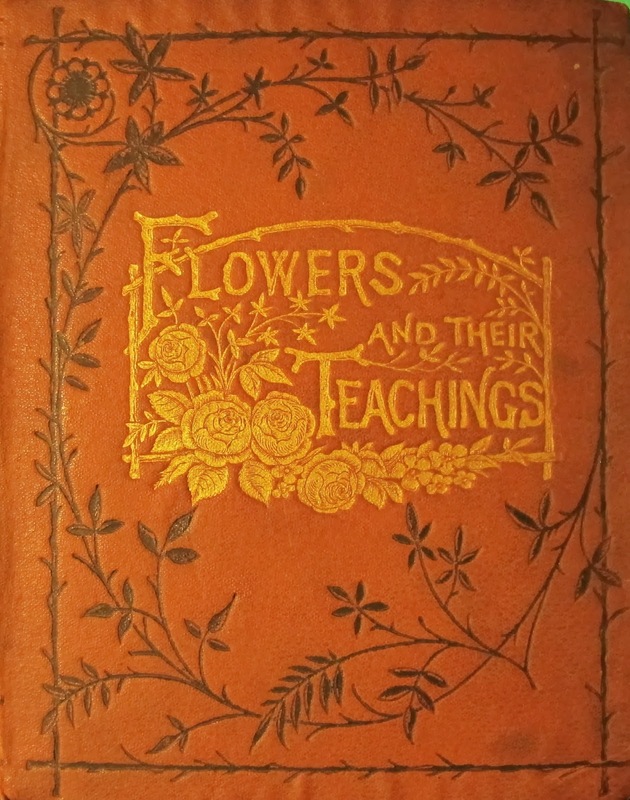 The title page gives us a hint of the many illustrations throughout the book. What a marvelous drawing. There is no author listed, but it is noted that the author wrote at least one other book, "Sunshine and Shadows in Kattern's Life". 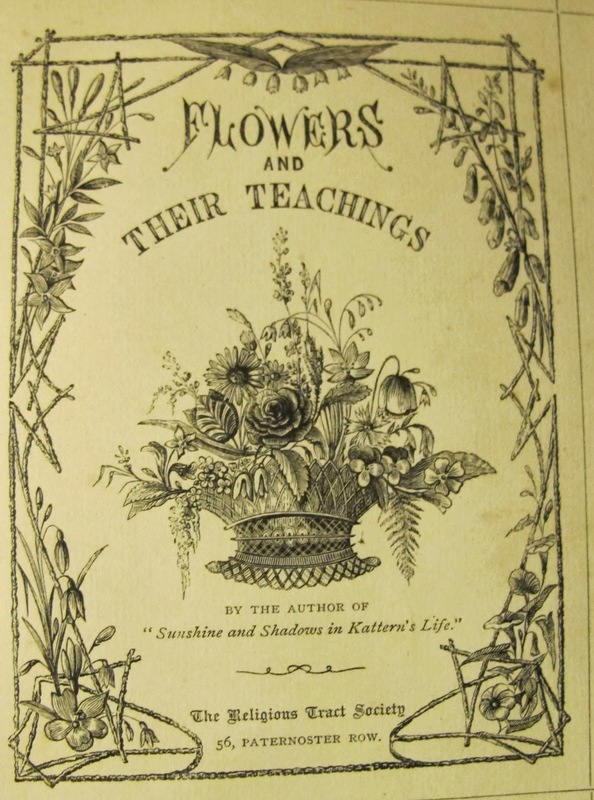 The publisher is The Religious Tract Society, and many of the teachings have a religious theme, but it really is mostly about flowers and gardening, and quite fascinating. 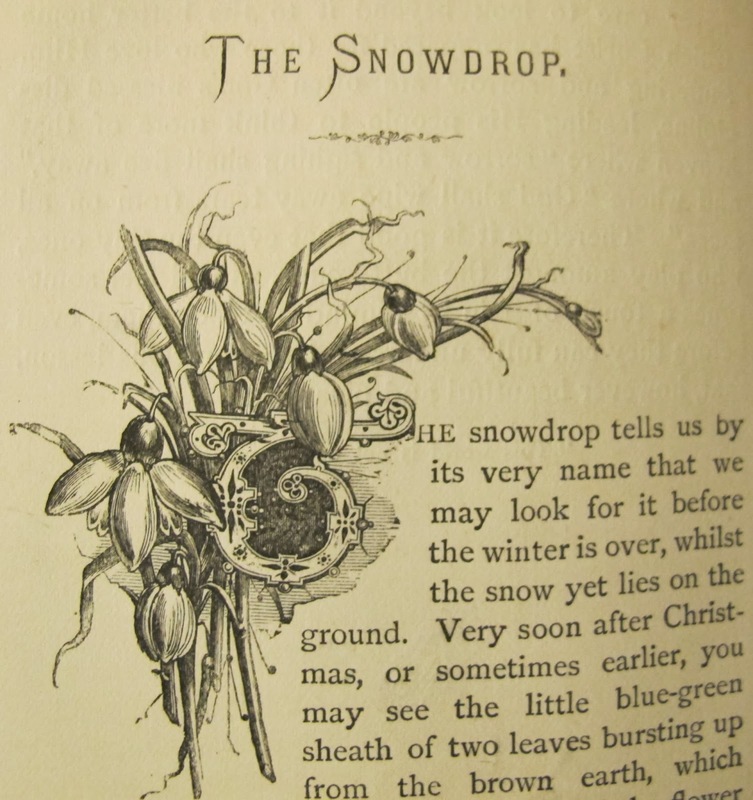 Every chapter, including a chapter on snowdrops, has a lovely drawing to embellish the first letter of the first word. 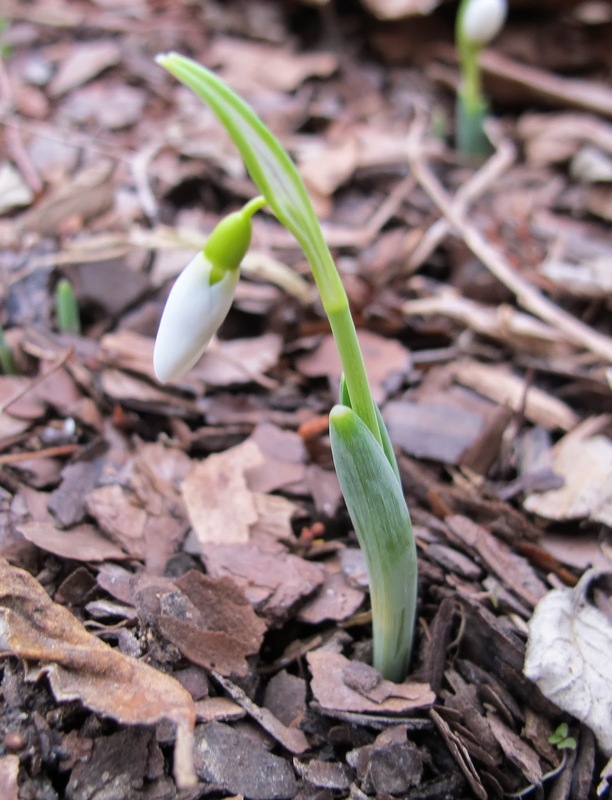 There are chapters on flowers -- snowdrops, daisies, daffodils, violets and more. There are also chapters on topics -- children and flowers, children's gardens, flowers and festivals, flower gifts and even flowers on graves. "The snowdrop tells us by its very name that we may look for it before winter is over... the little blue-green sheath of two leaves bursting up from the brown earth, which shows that the snowdrop is at hand; and the flower itself appears, a white globe of a bud, before it raises itself on its stalk, and hangs its beautiful blossom like a drop of snow over the cold garden-border or field..."
My first snowdrop appeared yesterday. It is a white globe of a bud, like a drop of snow... just as the anonymous author described it 136 years ago. What a treasure you discovered. It sounds like a very interesting book. It's really interesting to know that the tradition of awarding books for attendance started so early. I love garden books, and I've been collecting them for long enough that even newly bought books can almost count as antique at this point. However, I've gotten most of my 'old' books at library book sales - instant gratification. The Book of the Flower Fairies by Cicely M. Barker with its delightful illustrations (no date) Autumnal Leaves by Francis George Heath (1881) and a delightful book of serious botany Glimpses of teh Plant World by Fanny D.Bergen (1898) with chapters like A Bumble Bee in a Lion's Mouth, and Plumed or Feathered Seeds. Very useful! Where can I buy it. Or was it a unic find? Those drawings are marvelous. Congratulations on a great find! What a lovely little glimpse into history ! I have this book, but with blue cover. Unfortunately there is missing the last 70 pages. But it's awesome and beautiful book anyway.